Welcome to Goal Tec! We’re Saskatchewan’s premier goaltending shop. For the past 23 years, we’ve earned a reputation in the hockey community as the “go-to” store for all your goaltending needs. Our two locations in Saskatoon and Regina carry a huge inventory of the latest equipment and provide outstanding training for goalies at all experience levels. We stock the largest selection of GOALTENDING EQUIPMENT in Saskatchewan. Whether you’re just starting out or are looking for the newest set of custom gear, we sell everything you need to improve your performance and stay safe on the ice. Check out our full lineup of top brand names and customize the pads and gloves of your dreams at any of our dealer websites including Bauer, CCM, Vaughn, Warrior, and Brian’s. We offer custom Goalie Equipment ordering. Call +1 (800) 286 – 9003 in Saskatoon or +1 (306) 719 – 1560 in Regina for more information. We also carry the best selection of Pads, Gloves, Chest Protectors, Pants, Sticks, Skates, Masks, Bags, and other products in stock. We have Everything for Everyone! In addition to our huge inventory of the latest goalie equipment, Goal Tec is also your source for the best private goaltender training. 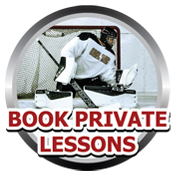 We offer lessons for all levels, from beginner to pro level. We’ve established ourselves as one of the best in the business and have invested in our facilities to make sure you’re getting the best experience possible. We offer real ice, an off-ice training center, and instant video feedback and analysis. Over the years, we’ve trained many top goaltenders like Darcy Kuemper (Arizona Coyotes), Connor Ingram (Tampa Bay Lightning), Dustin Tokarski (New York Rangers), Nolan Maier (Saskatoon Blades), Rylan Parenteau (UNB), and many more. No matter why you come to Goal Tec, you’ll experience our outstanding customer service. Our goalie-only staff has the knowledge and experience necessary to get the best fit and the best training for your individual needs. Contact us today to see how we can help you play your best game!